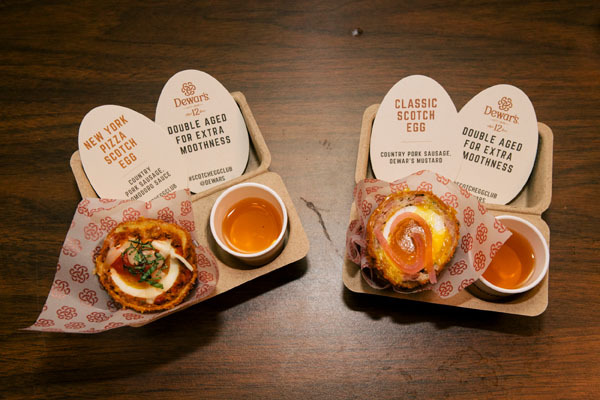 The Dewar’s Scotch Egg Club returned to NYC last night, with Hollywood’s favorite comic star Jason Biggs, who brought his talents for a night of quirky fun at the notable Liberty Hall at the Ace Hotel in New York. 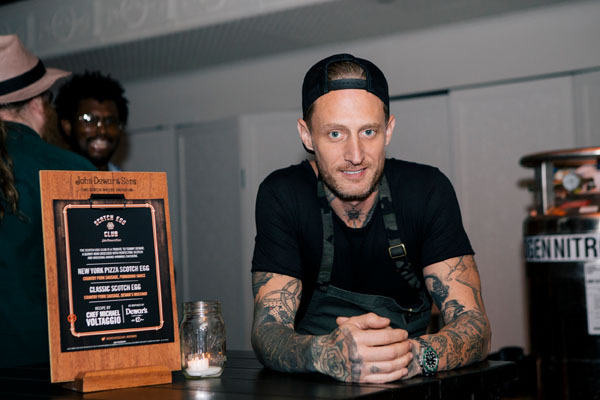 With help from renowned Chef Michael Voltaggio, guests were served delicious Scotch Egg bites – including a New York Pizza Scotch Egg – in between rounds of Chicken BINGO, led and called by Biggs himself. Cracking jokes as attendees anxiously waited for a mechanical chicken to “hatch eggs” onto a life-size BINGO board, Biggs chatted with fans in the crowd and drew laughs throughout the evening. To complement the taste of Chef Voltaggio’s custom Scotch Eggs, local mixologist, Veronica Correa prepared specialty DEWAR’S cocktails, ranging from a refreshing Scotch Spritz to a delectable Cobbler made with DEWAR’S 12 and Olorosso Sherry. 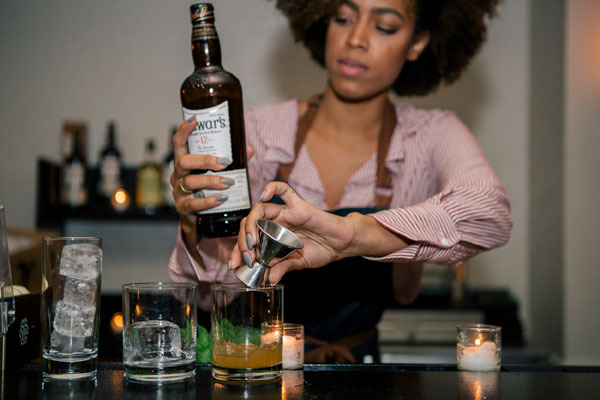 Not one to miss out on an opportunity to elevate the guests’ experience, Chef Voltaggio was spotted using liquid nitrogen to create a twist on a DEWAR’S cocktail and serving it like a sorbet – a frozen Scotch! Scotch expert and Brand Ambassador, Gabriel Cardarella caught up with guests during the evening, taking whisky enthusiasts through a tasting of the John Dewar & Sons portfolio, including drams of rare single malts ABERFELDY and CRAIGELLACHIE. Throughout the night, DJ Arianna Margulis brought energy to the crowd, spinning tunes of today’s top hits and oldies we all still love. In between rounds of BINGO, guests were able to pose with a fog backdrop that was printed with DEWAR’S, enjoy custom bites from Chef Voltaggio like Hamachi with jicama, short rib with whipped cheese, and beets with a goat cheese and horse radish “snow,” and try the John Dewar & Sons Vaporizer, which allows guests to experience the flavors of the whisky through a vapor mist.